This dessert is for coffee lovers only. I love coffee and I love panna cotta so this dessert is definitely for me. It is my idea of heaven. The recipe is dead easy except for the fact that it has gelatine in it and it is always tricky to know just how much to use. The amount required by the recipe never seems to correlate with the amount the gelatine container states is required to set the amount of liquid in the recipe so… doubt sets in. Added to that, the recipe called for gelatine powder (rather than gelatine leaves) which I have virtually never used so I didn’t have a feel for what should be used. And, of course, I had guests coming to dinner. Oh why, oh why, when I have guests, don’t I make something I have made before and know just how much gelatine to use? I was on alert as the recipe called for one tablespoon of gelatine powder. Now, this is one situation where it is bloody important whether it is a 20 mil tablespoon (4 teaspoons) or a 15 mil tablespoon (3 teaspoons). I knew, since it was an Australian recipe, it should be 20 mils, but you can never tell. A jelly that is not set is bad enough but a jelly that is so rubbery you can play football with it, is worse. The last thing I wanted was a rubbery panna cotta so I went with three teaspoons. My panna cotta were definitely on the wobbly side – too wobbly, in fact. I am going with 4 teaspoons (one Australian tablespoon) next time. As it turns out, the recipe was perfect. If only I had just been confident enough to follow it. I will next time. Once the gelatine is taken care of, everything else is a breeze. The recipe called for the mould to be lightly greased with butter and I was nervous the panna cotta wouldn’t come out. I usually dip the mould in hot water for 10 seconds but, be reassured, they came out relatively easily. I decided to add the coffee syrup as I thought it would enhance the presentation. I think it does and will do so again. The recipe was on a calendar, prepared and distributed by our local Council, showcasing businesses in the Shire. It was contributed by Yahava Koffee Works. Lightly grease 6 moulds then set aside. The recipe suggested tea cups but a dariole or pudding mould would also be perfect. Combine the gelatine and the water in a small bowl then set aside for 5 minutes. In a small saucepan, add the coffee, caster sugar and coffee liqueur. Bring to the boil. Remove from the heat and stir through gelatine mixture. Stir until the gelatine is dissolved. Pour the mixture evenly between the 6 moulds. Place in the fridge to set (approximately 2 hours). 1 tbs* gelatine powder – remember, that is 4 teaspoons. Combine the gelatine and cold water in a small bowl then set aside for 5 minutes. Combine the balance of the ingredients in a saucepan. Stir to dissolve the sugar then bring to just below the boil. Turn off the heat and add the gelatine mixture. Stir until the gelatine is dissolved. Allow the mixture to cool for one hour. Stir every 10 minutes. Give the mixture a final stir, then fill the moulds. Turn out onto serving plates by running a thin knife around the rim of the panna cotta. Serve with a drizzle of coffee syrup and some chocolate coated coffee beans. Put the coffee into a small saucepan. Add the sugar and stir over low heat until the sugar has dissolved. Bring to the boil then simmer gently, for about 5 minutes. Mix the cornflour into a small amount of the syrup. Add cornflour mixture to syrup. Continue cooking until the syrup thickens. 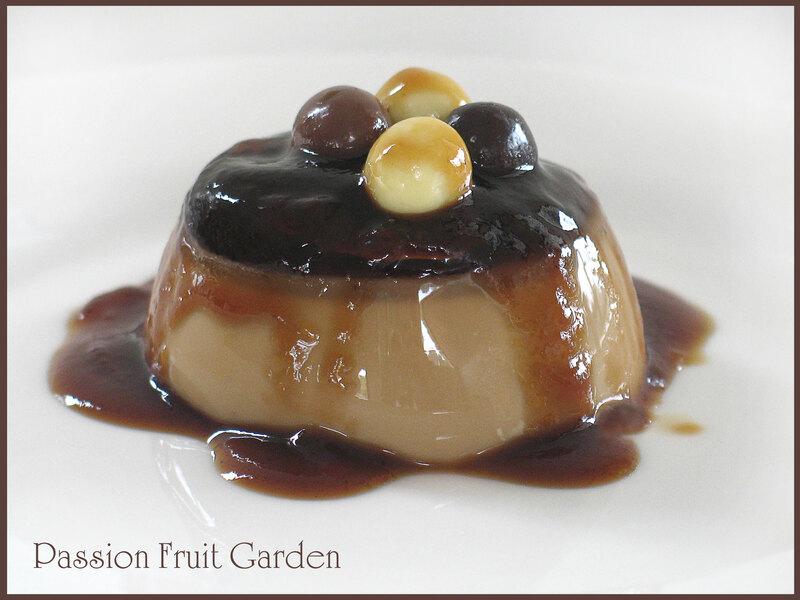 This entry was posted in Cold desserts, Desserts, Sweet Things and tagged coffee panna cotta by Glenda. Bookmark the permalink. These look quite good. i love panna cora in all its forms.. yours look particularly delicious..
Hi Moya, I made them again today. It is amazing how wonderful it feels when you know what to do. Hi Glenda, you make this panna cotta sound so easy, I made something similar to this and it came out 2 of the 3 times, will try your tried and true, thanks! Hi Cheri. The normal method to get panna cotta out of the mould is to dip the mould in hot water for a couple of seconds. It works every time. This sounds great. I am always frightened of both gelatine powder and the sheets. I once bought the wrong strength sheets and the recipe was a disaster. I am glad you have taken the mystery out of this. A lot of coffee which I love, but can’t have at night. I could hoover down one of these happily for breakfast. Hi Francesca, I too have killed several a gelatine desserts. One Maggie Beer recipe had so much gelatine in it I ended up with footballs, since then I am always on alert. This one though, was right. Hi Maureen, Glad to see you up and about. Brave or stupid? Who knows. Looks and sounds delicious Glenda. One I’d have to have at lunchtime, methinks, for fear of being alert all night! Sandra, I love coffee. Coffee, cream and chocolate, yum…. It looks beautiful to me Glenda. I had no idea that there were different tablespoon measures…always learning something new on these blogs. Hi Diane and it really matters when it comes to gelatine.